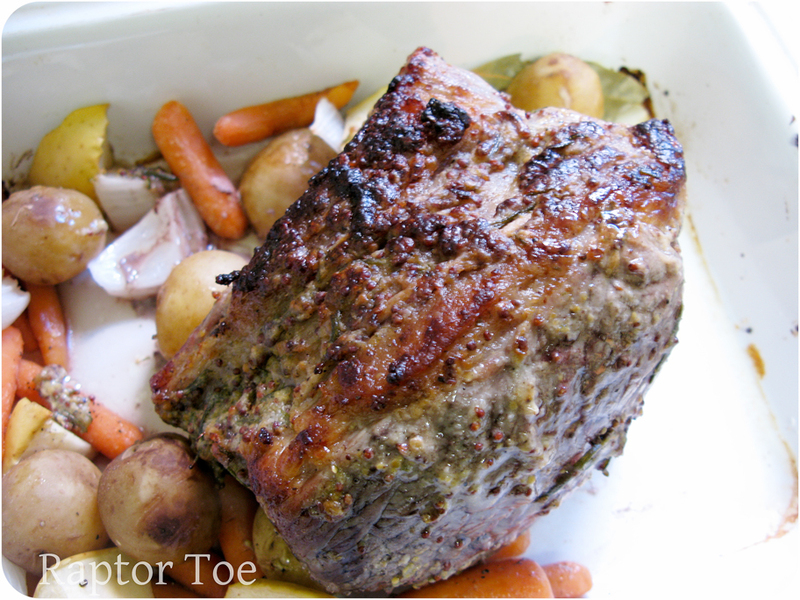 Roast Beef in August | Raptor Toe - Food, Baking, Fun. 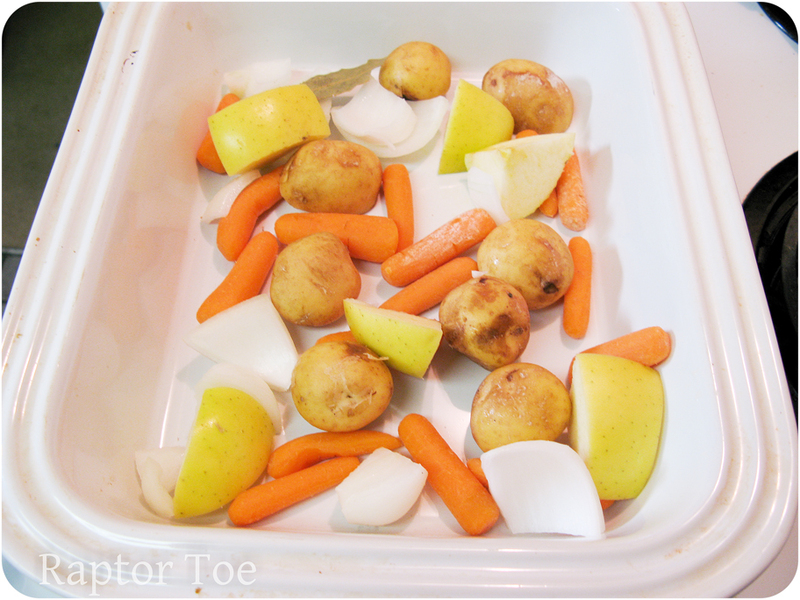 Place some aromatics in the bottom of a roasting dish. I used apple, potato, onion, carrot and I threw a bay leaf in there. I don't have a proper roasting pan, or a rack for mine. So the vegetables add flavour and keep the meat from boiling in it's own juices. 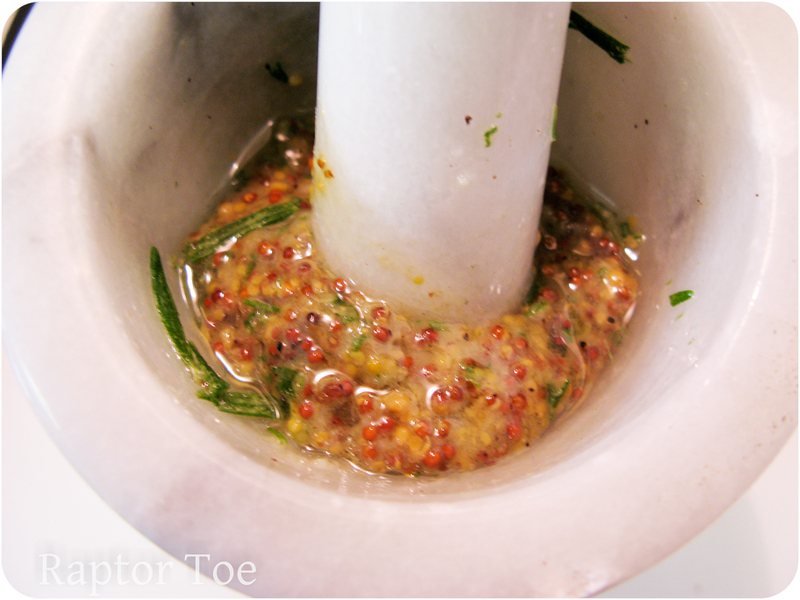 Mix 2 tbsp grainy mustard with 1 tbsp fresh rosemary, and 1 clove garlic. Salt and Pepper, this can be slightly saltier, because it's going over the whole roast. This was a 2-3 lb roast. 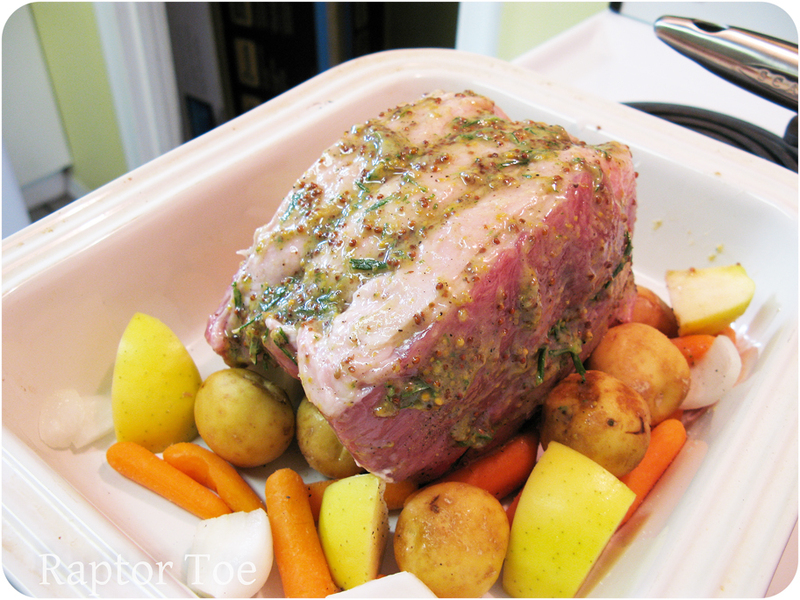 Coat with seasoning mixture and place in 425 oven for 15 minutes, after 15 minutes, cover roast loosely with foil, turn heat down to 325 and roast for an additional 45 minutes. Longer if you wish yours to be more well done. I cook mine until it reaches 125 inside. That's enough time to make yorkshire pudding! 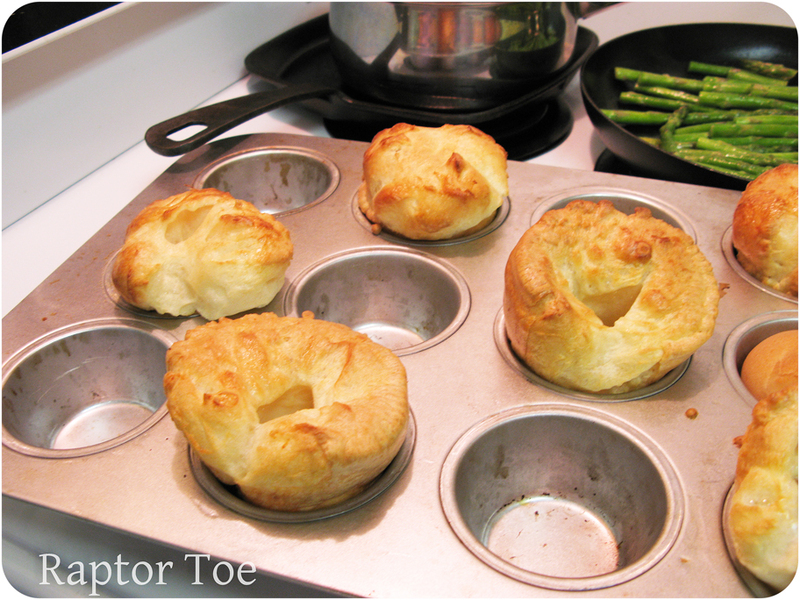 Preheat oven to 425, place 1 tsp of oil in each of 6 cups of a popover pan or muffin pan. Place in oven while preheating. Once oven is hot, and while wearing oven mits, open oven, and carefully pour batter in each cup. Be careful! I find it helps to pull the rack of the oven out a bit. Close door and bake for 20 minutes, until golden brown. 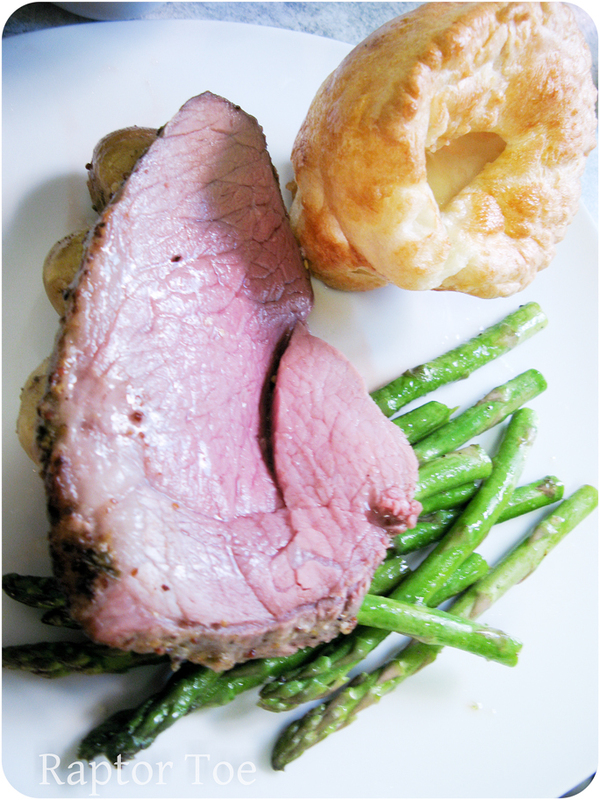 Have your roast and eat it too! This entry was posted on Wednesday, August 10th, 2011 at 3:37 pm	and tagged with appetizers, baking, blog, bread, brunch, butter, cooking, dinner, easy, food blog, garlic, gravy, healthy, jus, lunch, medium, mustard, perfect roast beef, popovers, rare, recipe, recipes, roast beef, rosemary, rosemary roast beef, savory, side dishes, steak, traditional roast beef, yorkshire pudding and posted in Easy Meals, Food, Savory. You can follow any responses to this entry through the RSS 2.0 feed. Was the flour for the Yorkshire Pudding self rising or all purpose? I agree, roast beef and yorkshire are good any time! I’ll try your recipe, looks delicious! 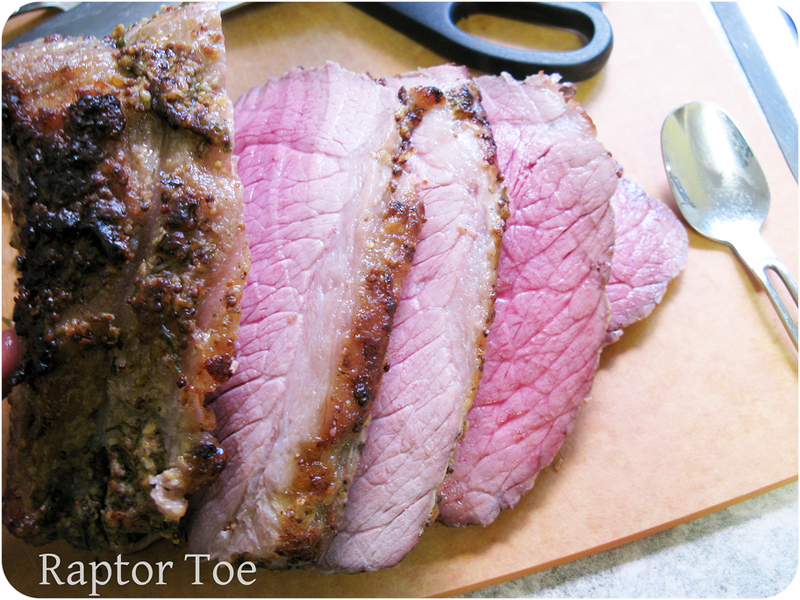 The roast beef is cooked perfectly; I am now craving some red meat! What a delicious meal. What a perfect roast beef! I would love this for dinner tonight! Wow – delicious! I have a huge central A/C so we can do the same, so I love it! I made soup earlier this week! This is absolutely beautiful plated with the yorkshire pudding! You explain it so well. Keep up the great work! Oooh, I just made a roast beef a week or so ago, so I am sooo with you on this one. I’ve never had a yorkshire pudding but now I want to try one!